Rajarshi Janakananda was Paramahansa Yogananda's most spiritually advanced disciple, and was also extremely successful on the material plane, being a self-made millionaire and funding much of Master’s work. It was in his honor that 40 devotees gathered at the Ananda Palo Alto temple on Saturday for a joyful morning of karma yoga, beautifying the church and the grounds. We started with a two-page “wish list” of projects, and a truly impressive amount of them were accomplished. 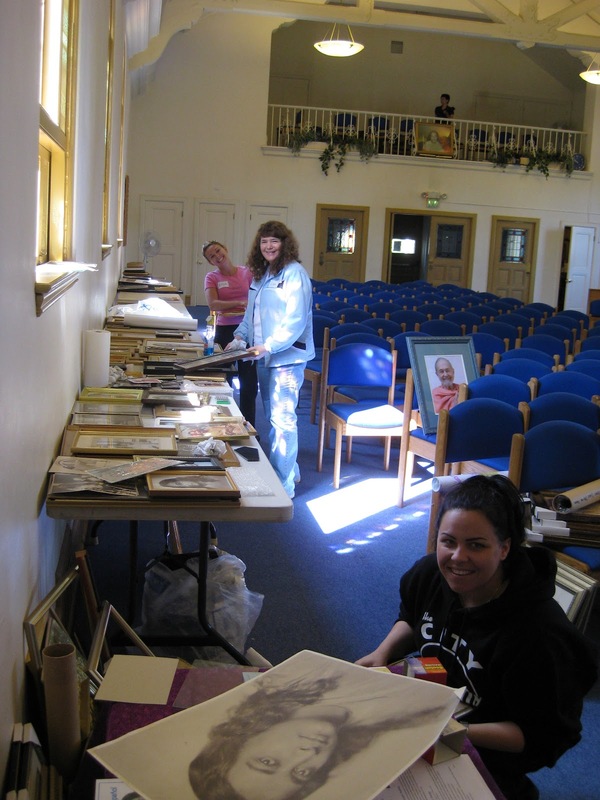 Some of the indoor projects included cleaning carpets and chairs; building some new storage shelves; cleaning and organizing vases, candles, candleholders, altar cloths, closets, and supplies; and framing or reframing many pictures of Master and other saints. The yoga center is also enjoying a newly cleaned entrance and sparkling windows. Outdoors, one of the largest projects was laying down a coat of primer on the teaching center walls that have yet to be painted. This necessitated, of course, the extra step of covering in plastic anything that didn’t need to be covered in primer. We also had a team of gardeners working with the plants around all the buildings, and a duo of Cinderellas scrubbing stains off the courtyard paving stones. And in the midst of all that, we also replaced the gutter downspouts, and cleaned and organized the dumpster and storage areas. It was a beautifully productive day that left not just the temple but all of us buzzing with new energy and magnetism. Well done, all! In 1994, after seven years in a suite of office rooms on California Ave., we scraped together the downpayment for a church of our very own and moved into what is now the Ananda Palo Alto temple. The building was formerly a Catholic church, but Asha said that when they visited it for the first time, they found there a copy of Autobiography of a Yogi, as well as Swami Kriyananda's autobiography, The Path. So it felt like Master was already there, getting it ready for us. The 1994 congregation making the inaugural march to the new temple. At the time, we didn't know how we would be able to handle the new mortgage payments that were more than triple our previous rent, but in true Ananda spirit we put out all our best energy and trusted in God to carry us through the rest of the way. All of that energy and grace over the last 17 years has transformed the temple into a beautiful, sacred space, drawing and inspiring truth-seekers from all around the Bay Area and beyond. and a more recent photo of its new incarnation. At the beginning of this year, we still had approximately $1 million of debt left to be paid off on our church. The “Free and Clear” campaign began with the goal of eliminating that debt, and this was the theme of Sunday’s fundraising luncheon. Lunch in our beautiful piazza. After service we enjoyed a tasty Indian buffet and assorted desserts outside in our Italian piazza. 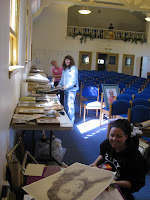 Around the courtyard were displays of various old photographs of the church as it was when we first moved in, and of Ananda members painting and renovating it. There have been some pretty dramatic changes over the years since then! Asha spoke of our church's short history, and the larger sweep of Dwapara Yuga ascending that we're all part of, and Shanti led us in affirming as a community our goal of owning the church outright, that we might truly give it as a free gift to God and gurus. You may have seen the jigsaw puzzle picture of our church that has been on the altar recently. Each puzzle piece filled in there represents another $25,000 that has been paid off. Sunday’s event (and some other activities leading up to it) resulted in an impressive $107,000 collected, with an additional $87,000 pledged over time. Well done, all of us! See more photos of the event here, as well as a selection of video clips here. In other photographic news, we have an updated congregation photo online. Look at all those beautiful, joyful faces! This year's Easter congregation photo was the FASTEST EVER. It took about 10 minutes to have everyone line up and take their smiling faces. And it took a volunteer Photoshopper (Jeff C. - thank you very much) about 6-7 hours to roll some heads, till all the best ones were in this final composite. 'Off with their heads' has a more positive connotation these days.